#28 Kenny Irwin Texaco. #2 RUSTY WALLACE 1998 ELVIS MILLER LITE FORD TAURUS. #41 Steve G. KODAK. #44 TONY STEWART 1998 SHELL SMALL SOLDIERS. This listing is for the 1997 Revell 1:43 Diecast NASCAR #29 Cartoon Network Hanna-Barbera Scooby Doo Car Bank that is pictured. 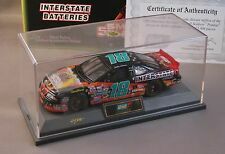 1999 CHEVY MONTE CARLOS- ACDELCO&DALE JR.-1999 REVELL 1/43 SCALE NIB. Condition is Used. Has not been out of original package. Please see all images and ask any questions.thanks for looking. Brand new in box condition. 1/43 scale Revell Collection item #101939 The 2001 #3 Gm Goodwrench / Oreo / RCR / Chevrolet Monte Carlo as driven by Dale Earnhardt Sr. Limited edition 1 of 48,084 produced and includes certificate of authenticity This car is nicely detailed and includes and opening hood to show off the engine detail. Beautifully applied authentic paint and markings finish off this sharp model and it even includes a nice showcase to keep the car clean and dust free while on display. 1/43 scale Revell Collection item #439916077-2 1999 #24 Dupont / Superman Comics Chevrolet Monte Carlo as driven by Jeff Gordon. Painted with the actual Chromalusion color change paint that was on the real car! Limited edition 1 of only 5,508 produced and includes certificate of authenticity This car is nicely detailed and includes and opening hood to show off the engine detail. BOBBY LABONTE. 1998 REVELL COLLECTION. SMALL SOLDIERS. 1:43 SCALE. LIMITED EDITION ONE OF 5,004. #18 INTERSTATE BATTERIES. It is the #5 car, Terry Labonte, 1997 Chevy Monte Carlo. It is a limited edition. It is 1/43 scale. This is a 50th Anniversary series. This is in mint condition. It was only out of the box to photograph. This item is a limited edition Revell Collection replica racecar of the Team Pennzoil Chevrolet Monte Carlo Driver #1 Steve Park in 1998. This item remains in excellent condition although the Certificate of Authenticity has been torn a little. This Is A Nascar #88 Dale Jarrett Quality Care Ford Thunderbird In A Red White & Blue 1:43 Scale Diecast On A Display Stand In A Plastic Display Case With Certificate Of Authenticity From Revell 1997. Revell Collection. 1997 FORD THUNDERBIRD. Opening hood, Free wheeling, detail finished side skirts. THIS IS A RARE FIND ! ONLY 7,512 MADE THATS ALL! Certificate of Authenticity Enclosed! detailed wheels, engine, interior, undercarriage. 1 of 3,000 Diecast Replicas. Display case and Certificate of Authenticity included. New and unopened. CAMEL JOE JIMMY SPENCER 1997 FORD THUNDERBIRD REVELL 1:43 scale #/7,512 made +1! LIMITED EDITION MOM & POP'S NEIL BONNETT 1/43 SCALE RACE IMAGE COLLECTIBLES CAR numbered to #/5000 made. Revell Collection. David Green #96 CAT Racing. Includes Certificate of Authenticity. 1997 Chevrolet Monte Carlo. Steve grissom chevy monte carlo #41 1/43. It looks good in the clear case revell The scale is 1/43. REVELL COLLECTION. JIMMY SPENCER. # 23 WINSTON NO BULL. NASCAR RACE CAR. From a none smokers house. These Cars are all from my personal collection. Dale Earnhardt #3 2001 GM Goodwrench OREO. 1/43 Revell, hood open, trunk open, in its own collector case and certificate of authenticity. Never opened. Car is new and unused and in Mint/Near Mint condition. COA included. Box is in good to excellent condition with shelf wear. Limited Edition. 1 of 5004 produced. Car and display case are in new and unused condition. COA included. Diecast is new in factory box. Box is in near mint condition. YOUR LOOKING AT ONE 1999 DALE EARNHARDT JR. #3 AC DELCO MONTE CARLO LIMITED EDITION REVELL 1/43 SCALE DIECAST CAR HOOD OPEN WITH CLEAR PLASTIC COVER. 1 OF 4,008 DIECAST REPLICAS. CERTIFICATE OF AUTHENTICITY ENCLOSED. WALLY DALLENBACH #46 WOODY WOODPECKER RACING NASCAR CHEVROLET MONTE CARLO 1997. 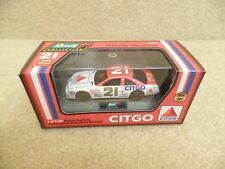 1:43 SCALE NASCAR MONTE CARLO ONE OF 8,012 DIECAST REPLICAS HOOD OPEN. MINT CONDITION WITH BOX! Dale Earnhardt Sr #3 Oreo / GMGW. 1/43 Scale Revell. Mint & Never Opened or Displayed. Woody Woodpecker Graphics, The Number 46 on the Doors and. NASCAR Racing. This is NOT advised. Hard Plastic Case & Autographed Stand. This will keep the cost low. MINT IN MINT BOX . Up for sale is a 2001 Revell ~ 1/43rd Scale ~ Dale Earnhardt Sr #3 ~ Goodwrench Service Plus / Oreo ~ Chevrolet Monte Carlo.MINT ! Limited Edition.1 of 48,084. If you don't have the room to display bigger models, this is the perfect size for you. The box is in good condition. It is in good condition. JEREMY MAYFIELD. 1997 REVELL COLLECTION. #37 KIDS RACE AGAINST DRUGS. 1:43 SCALE. LIMITED EDITION ONE OF 5,004. This Is A Nascar #5 Terry Labonte Special Kellogg's Car In A Blue & Orange Chevy Monte Carlo 1:43 Scale Diecast On A Display Stand In A Plastic Display Case With Certificate Of Authenticity From Revell 1997. Brand new in box condition. 1/43 scale Revell Collection item #439935215-2 1999 #3 AC Delco / Superman Comics Chevrolet Monte Carlo as driven by Dale Jre. Limited edition of only 5,508 produced and includes certificate of authenticity This car is nicely detailed and includes and opening hood to show off the engine detail. Beautifully applied authentic paint and markings finish off this sharp model and it even includes a nice showcase to keep the car clean and dust free while on display. This is a 1998 Kenny Irwin Texaco/Havoline Ford Cup car 1/43. is new in mint case and box. Dale Earnhardt # 3. Plastic case.